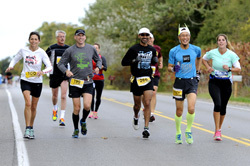 Registration is open for our race scheduled for October 6th, 2019. Featuring a Boston Qualifying Full Marathon, a Half Marathon as well as a Team Challenge, where there can be 2-5 runners. All events are open to runners, walkers and wheeled athletes.